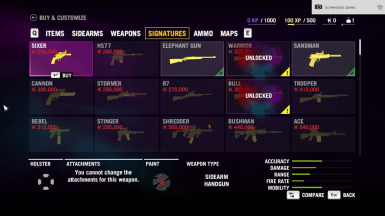 This mod removes all of the requirements and locks from weapons, attachments, signature weapons and skills. It also unlocks the North so you can play the game however you like and bypass the campaign completely (if you wish). 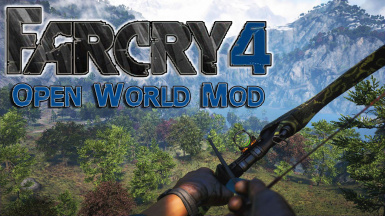 FAR CRY 4 OPEN WORLD MOD! 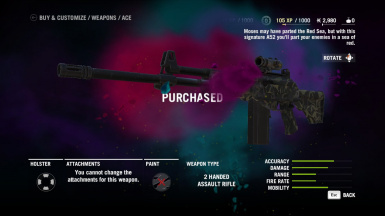 Adds back the ACE signature version of the A52 Assualt Rifle that was cut from the game by Ubi (for some starnge reason). You can purchase this just like any other signature weapon. Removes all the requirements from skills so you can purchase them whenever you like (you still need to acquire them in order - i.e. one health slot, then 2 health slots, then 3 health slots, etc.) but you no longer have to wait until later in the game to buy them nor do you have to do "x" amount of certain things to unlock them. 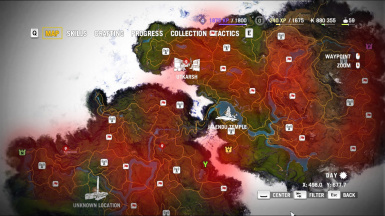 Opens the North from the very beginning of the game. It will still be covered in fog until you climb bell towers to remove the "fog of war". The Kings Bridge will still warn you "Dangerous Territory Ahead" when you try to go into the north, but the game will not prevent you from doing so should you wish to. The only items still "locked" are the items you gain access to from the Trade Agreement Skill (sticky explosives and fire/explosive arrows) since that is the only purpose of the skill. 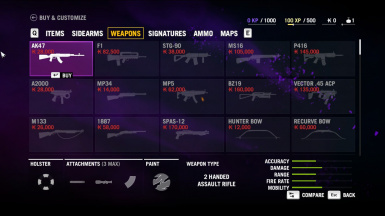 Also the Guns for Hire abilities require certain levels of Karma which makes sense because the Golden Path is only going to help you if you help the people of Kyrat. Otherwise all guns, etc. are unlocked from the very beginning. The intro logo videos are removed for faster startup of the game. 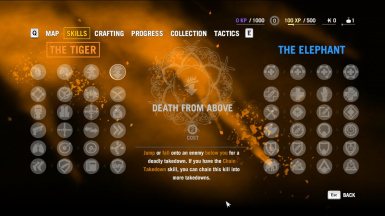 Removes Yellow / White objective arrows and pulsing circle around objectives. Removes laser beams from sniper rifles. Removes annoying constant on screen prompts such as vehicle controls, HOLD E to EXIT vehicle, HOLD R CANCEL ARROW / HOLD R NORMAL ARROW, HOLD F DROP BODY, HOLD Q to HEAL when you are hurt, etc. Changes most keys to just press instead of press and hold. INTERACT: Press E to use or pickup items. Press and hold E to use grappling hook. RELOAD: Press RELOAD KEY to reload - press and hold RELOAD to bring up weapon wheel. HEAL: Press HEAL KEY to heal. Press and hold HEAL to bring up syringe wheel. Thanks so much and stay fierce my friends!